Pandora jewelry is a fashion trend that has swept (and continues to sweep) the fashion trend-setters by storm. It offers an amazing and needless to say, beautiful, range of beads with specail bracelets and necklaces. They offer an easy modular, changeable system that easily allows wearers to change look, colour, and feel of their jewelry adornment as the occasion demans and as they spirit calls to them. To this end, there is an endless and mouth-watering range of beads - with new designs appearing all the time - which can be used and changed - on a single bracelet (or necklace, or earring). Born in Copenhagen, Denmark in 1982, this jewelry style has grown exponentially and now is sold in over 20 countries and enjoying a long-lasting wave of success. It employs well over a thousand people and has a number of well-respected designers who have elevated the original design to a worldwide recognizable style. The Pandora signature style and customisable charms are so overwhelmingly desirable that you will often find imitations of them anywhere you go. The genuine items are mainly produced in precious metals like gold and silver, and as such, the prices are beyond the reach of many. For this reason alone, the imitation Pandoras have accumulated a large following as well. One of the best quality of these Pandora-style jewelry is found on ClearlyChosen who offers well made manufactured items that are close to the real thing as well as offering all the Pandora features found on the real items. Pandora jewelry created the unique threading system that has become one of their defining features. The threading system adds a layer of safety while still allowing the wearer to easily add, remove, and rearrange the beads on the chain. Each bracelet (or necklace) is divided by 2 Clip-on Sections into 3 sections which offers a handy way of arranging the symmetry of beads and charms on the bracelet. 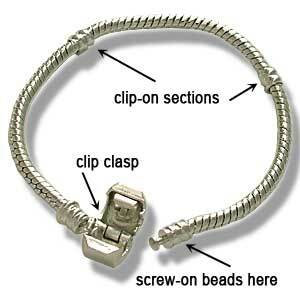 By using a unique clip bead on these clip-on sections, beads on each section are secured within the designated sections. Each Pandora bead and charm is also threaded on the inside so that it is actually screwed onto the chain itself. Its very clasp is another of Pandora's signature features - it is a clip-clasp that when closed, looks like a bead itself. And among the many clever offerings, there is also a security-chain that screws onto the beginning and end of the chain so that when the bracelet is closed, it forms a security chain across the clasp - which ensures the safety of the beads in case of mishap. And maybe just as importantly, it also works to enhance the visual trendiness of the item. Thinking of getting a Pandora(-style) bracelet and joining the hip crowd? Just remember you will be adding charms and beads which will make the final fit tighter. As a general rule, your bracelet should be approximateley 1.5 inches (3.75cm) larger than the measurement of your wrist. So if a snug measurement of your wrist is 19cm then get a 22-23cm bracelet. This means you will have enough room for beads and charms. Among its other lines of jewelry, Pandora also offers an enticing Mix-and-Match earrings with various charms that can be interchanged easily for different looks and styles.